A new week means a new hilarious throwback clip from Easterns. In this funny video, Biz Markie makes an appearance for the first time. For those who don’t know, Biz Markie is a notable rapper from the 90s with the hit song “Just a Friend” that still plays on the radio today and is actually made VH1’s list of the 100 Greatest Hip-Hop Songs of all time. 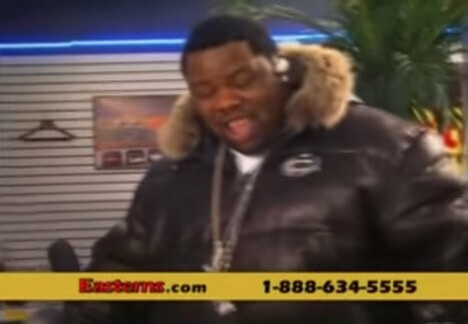 Biz Markie is seen going crazy over a Ferrari that he sees in the Easterns showroom. Lavar Arrington comes over to assist him and reassures him that he could really have the car if he wanted it because at Easterns, “your job is your credit”. Evidently things worked out for the best. 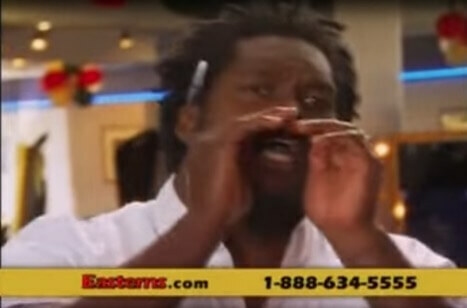 By the end of the clip, Biz is seen jokingly singing the Easterns jingle for Lavar and a few of the salesmen. It’s hilarious skit so be sure to check it out and share on social media! Easterns is a company known for their transparency along with the open and honest communication with customers. Robert Bassam built Easterns Automotive Group on the foundation of providing any and all customers with excellent customer service in the DC, Maryland and Virginia area. In this Throwback Thursday clip of the week, two Easterns employees are shown telling customers the word “no”. Then they are both put in a headlock and told to never tell a customer “no” at Easterns. It is great to see how important Easterns treats customer service! If you are looking for a car dealer that will always go above and beyond, Easterns is the right choice! Easterns is clearly the best branch of car dealerships in the DC, Maryland, and Virginia (DMV) community. Every week just keeps getting better with these awesome Throwback Thursday videos. 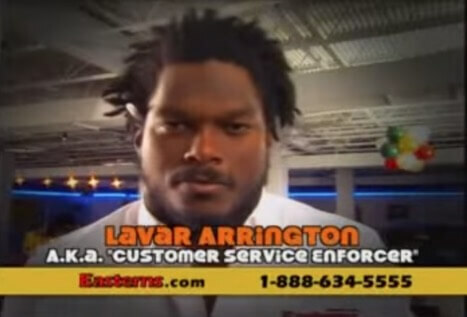 In this clip, LaVar Arrington is seen speaking with a customer about a vehicle. The customer then proceeds to ask a question about the size of the trunk. LaVar calls for a few Easterns to show the customer the trunk of the vehicle. When LaVar opens the trunk, three car salesmen get in to show the customer how much room the trunk really has. The trunk fit 3 people! Easterns did it again with this short skit showing how as a business it is important to always go above and beyond with amazing customer service! In this funny clip, Carlos Rogers is seen pushing an Easterns employee to the ground after overhearing his bad customer service skills. Easterns does not encourage violence. These funny skits are just used to show people that Easterns takes customer service very seriously. Many car dealers will tell their customers “no” if they feel like they won’t be able to help them. That’s not what happens at Easterns! “At Eastern Motors, your job is your credit!” The ultimate message is that if you have a job then Easterns will get you in a vehicle despite your credit score or financial background. Easterns works with over 30 different bank lenders to ensure that customers can find one that fits their financial situation. 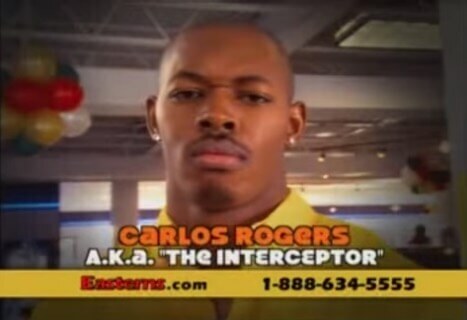 In this funny clip, Sean Taylor is seen tackling a car salesman. He then proceeds to stress the importance of customer care. At Eastern Motors (Easterns Automotive Group), the customers are the number one and top priority. It was truly refreshing to watch Sean Taylor in this clip because as most know he passed away back in 2007. Though the clip was funny, it was also informative about the Easterns brand. There isn’t much footage of Sean off the field so this is definitely a rare gem. 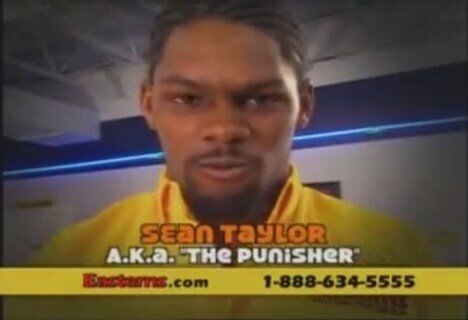 We are sure that both fans of Sean Taylor and the Washington Redskins will fall in love with this skit. On behalf of Easterns Automotive Group, we continue to send our love, prayers, and condolences to the family, friends, and fans of Sean Taylor. As a company, Easterns will continue to praise his good work. In this clip, LaVar Arrington is seen reinforcing the importance of customer service after seeing a salesman take a call while conversing with a customer. This is definitely something that should never be done. Eastern Motors (Easterns Automotive Group) prides themselves on being a company that provides excellent customer service. LaVar did a great job stepping in to discipline the salesman because it shows customers that Easterns will not stand for anything they do not believe in. This clip also shows our customers that Easters will not tolerate unacceptable behavior from employees in the workplace. Customers and their needs are always a first priority. All of these are reasons that Easterns has continued to be one of the one of the top car dealers in the DMV (DC, Maryland, and Virginia). It is clear to say that starting in the 2000s, Eastern Motors became a phenomenon. Rarely do you see a branch of car dealerships become a household name both locally and nationally. Easterns had the ability to do what most brands and companies couldn’t. They are most known for their catchy jingle and hilarious commercials with celebrities and major sports players. 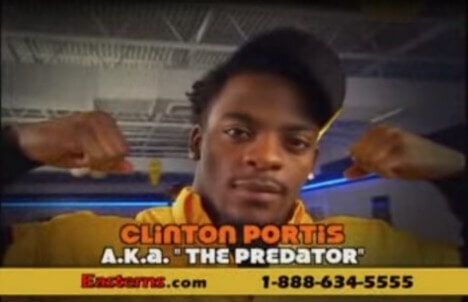 The Easterns Training Camp series is a compilation of skits and comedic monologues staring LaVar Arrington, Carlos Rogers, Clinton Portis, and Sean Taylor all formerly of the Washington Redskins. All players were playing for the Washington Redskins when this was recorded. Eastern Motors nicknamed these guys according to their role in each skit. LaVar Arrington aka “The Enforcer”, Clinton Portis aka “The Predator”, Carlos Rogers aka “The Interceptor”, and Sean Taylor “The Punisher”. In Day 1 of the training camp, the guys are seen talking about whooping the new trainees into shape on behalf of Easterns. As most know, Sean Taylor is no longer with us so we continue to send our thoughts, prayers, and condolences to his family, friends, and fans. The legacy of Sean Taylor will live on forever and he will always have a special part in the hearts of everyone.